Details: An attractive portrait of a young lady whose attribution to John Opie was assisted by Mr Kitson, Keeper of British Art at the Walker Gallery, Liverpool. The dark background of the work is tempered by a small loosely worked landscape to the side, a technique which Opie employed in many of his portraits of young women. This portrait was originally attributed to the circle of Sir William Beechey. However, it came to the attention of Mr. Kitson, Keeper of British Art at the Walker Art Gallery, Liverpool, where there is a very similar portrait. He suggested further research, and following this it is now attributed more precisely to one of Beechey’s associates, John Opie, who was Professor of Painting at the Royal Academy Schools until his untimely death at the age of 46. Opie was a Cornishman, the son of a carpenter, who was taken up by John Wolcot, (an amateur pupil of Richard Wilson), who trained him in portraiture. Between 1776 and 1769 Opie travelled round Cornwall and Devon as an itinerant face painter. Wolcot then brought him to London and promoted him as ‘The Cornish Wonder’. He was patronised by Sir Joshua Reynolds who gave him lessons, and was then presented to George III and Queen Charlotte who bought his work ‘Beggar and Dog’. Not surprisingly, he then met with almost instant success, painting some 500 portraits and exhibiting 143 works at the Royal Academy. He was elected A.R.A. in 1786 and R.A. in 1787. His work is exhibited in many major collections. Normally, John Opie gave portraits a plain dark background. However, in a few works - mainly portraits of young women - he used a small loosely worked landscape on one side to balance the severity, as in this work, of a dark dress and shawl. For further comparisons see the Witt Library: Portrait of Mrs. Jordan Box 1782 - Portrait of Amelia Opie as a Gleaner Box 1783 - Portrait of Mrs. Reynolds Box 1784 - Portrait of Mrs. Winnicome Box 1785 (currently exhibited at the Hermitage Museum). For detailed treatment of dress drapery see the portrait of Lady Elizabeth Whitbread in Box 1785. 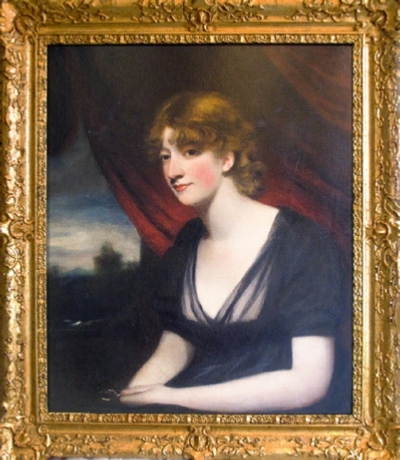 A portrait of an unknown lady also holding a pince-nez can be seen in Box 1786.